Discussion in 'HP' started by 2.0, Sep 3, 2010. 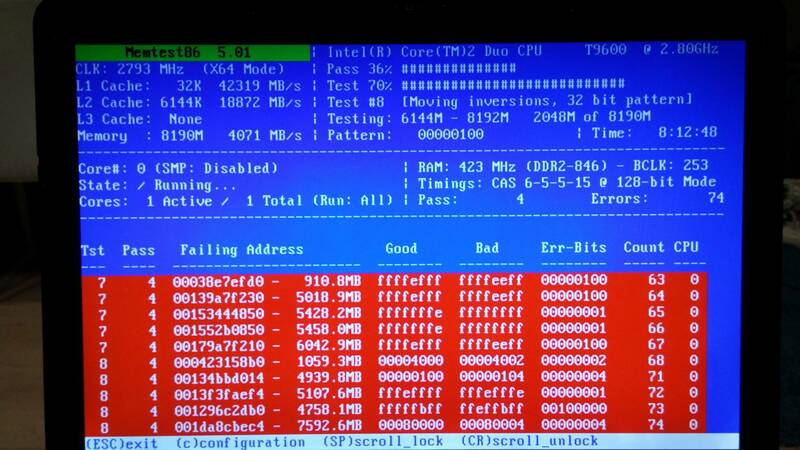 I guess the RAM is faulty. So I think the video card is functioning fine. EDIT: running Throttlestop causes reboot. I'd like to repeat with the official BIOS, but I can't now. So I would appreciate if anybody could do that instead of me. I would launch a game and play for a while, but due to the RAM is not functioning well, I will postpone that until I figure out the cause. EDIT: That was an old 2.99 version. Now I'm running 7.00 and it's working fine. This is just an example, don't use it. The setup is unstable. Remove the BIOS chip, attach to the programmer, flash and solder it back. It took me around 2 minutes every time. 2 minutes including soldering. Incredible fast. With a pristine, stock copy on the spare recovery eeprom it only needs tweezers to have a booting system again. Don't even need to switch it off; hot-swapping is fine, even if the OS is running (it is looking at a shadowed copy in RAM, not the one on the eeprom). Wonderful thing though; found a supplier last year that carries 150mil adapters (at long last), so can now also do the MXM cards without too much hassle. triturbo, RickiBerlin and remdale like this. Perfect thing! Actually, I was thinking of DIP8 socket, but this one is what we all need. Thank you so much! It's a good, but useless thing. A good, but useless thing because vBIOS is executed from the system BIOS. So the vBIOS chip is useless. I even tried to remove it from the videocard and try to boot. The system booted up fine. 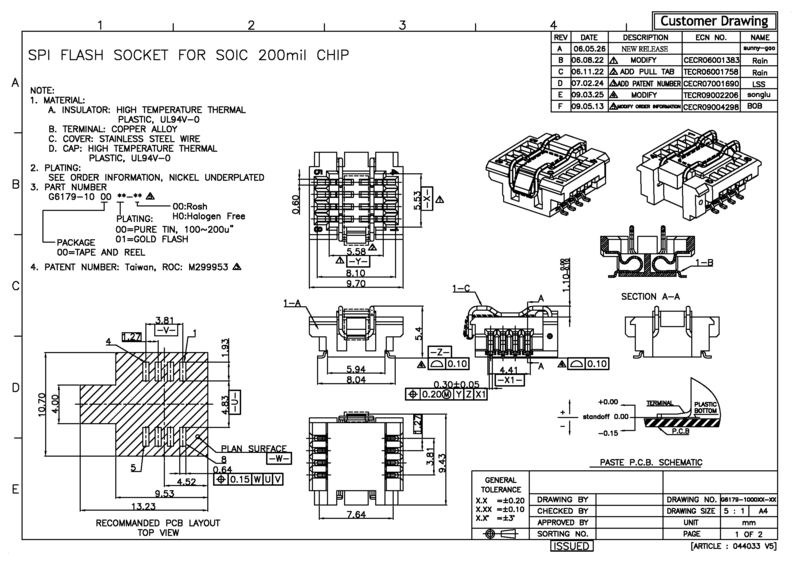 I'm looking at the picture of the SOIC8 socket and coming to understanding that it might not fit because of its height. It seems a bit high to me, but I will try to try it out. Its height is 5.4mil which is too much. It's just 2.9mil in height, should fit fine. But I'm not 100% sure. I've got an idea. The latter socket is used for a different type of chips. Just look at this example. So we could just replace the original chip with a different one (WSON8) to fit the socket and the space under the keyboard. A useless thing, but it is a good idea for protecting BIOS from malware in this way. I had an idea to lead out a wire and attach a button to be able to disconnect the chip from power source when working under OS, but actually we could simply manage the WriteEnable pin to not let anything flash BIOS. So in this case the only option to flash BIOS would be flashing with a flash programmer. Don't even need to switch it off; hot-swapping is fine, even if the OS is running (it is looking at a shadowed copy in RAM, not the one on the eeprom). I've used this trick to force-flash a same-version bios to a semi-bricked system. Dropping in a hex-edited version made the flash tool think an older version was installed and this made it initialise the pre-flash sequence during the first reboot. Don't have a Dragon; my systems don't use vbios oproms, so here the MXM eeprom is essential. I'd remove the oprom from the bios entirely and relocate it to the vbios eeprom. 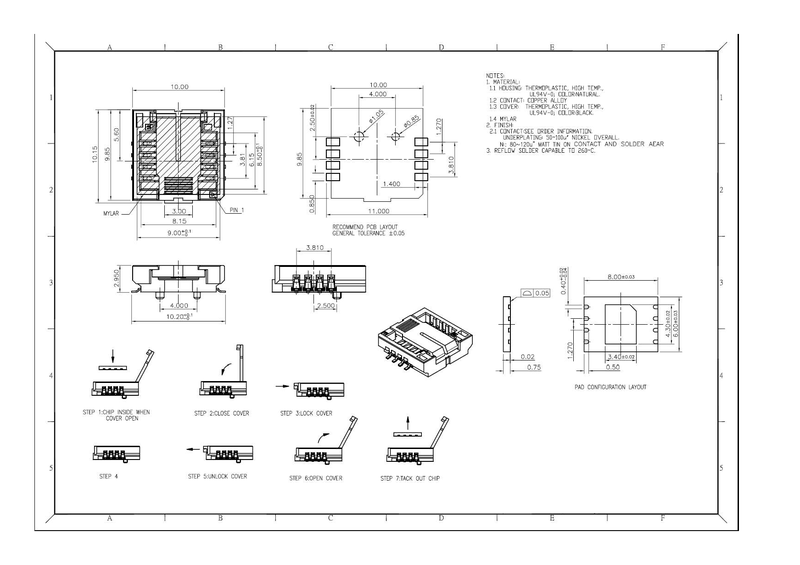 From the schematics it looks like the MXM is fully connected, so the system ought to detect the physical chip just fine once it can't find an embedded vbios (which takes precedence). You'd think that such a large system would have plenty of space. Is it in such an awkward location? Most of the tall inductors and capacitors are taller than these adapters, so never really had much of a problem fitting them. The black-clip model could be sanded down a bit by about 1mm without loosing the clip function. But if you'd use some other method to push down the chip into the contacts then you could trim it down another millimeter. If it's underneath the keyboard or the bottom cover then a bit of glued-on foam at the right spot should work. That WSON8 model looks nice, but its soldering feet are spaced 2.5mm farther apart. It could still make contact though, but soldering it properly will be tricky. The type of plastic they've used can't handle a hot air gun, so each pin has to be soldered individually with a small tip and being so wide you'll have difficulty accessing the solder pads. What you could do it wet each of it pads with a dab of solder prior to setting it in place. Then use a drop of glue and fix it firmly to the right spot, let it harden and heat the adapter's pins at the bit that is sticking out at the farthest end. The heat will travel through the entirety of the pin and reflow the bits of solder indirectly. A hardware write-protect is easier. Just make sure to select a chip where the WP-pin has vetoing power; with some models you need both the pin and the software wp registers to be active, whereas with others merely using the hardware pin is sufficient. It's great to see some really gifted tech people on this forum again. First I will need to find out how to make BIOS read the external chip. But thanks anyway, I will check that out when possible. That's too much. We might not be able to place the keyboard back. Anyway, I need to buy the socket first. I've got a good news. My Dragon seems to be operating fine with the new RAM. So I will do some tests regarding X9100 overclock and write back here later. 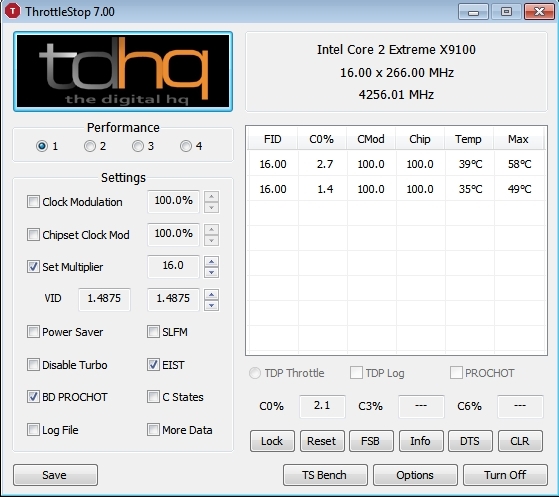 Here is the X9100 temperature comparison under stress, if you are interested. You seem to have the SLB48. Yes, mine is revision C0. We should compare temperatures when at FSB266 in this case. I've done some basic testing when was playing Driver San Francisco. The highest stable multiplier I could get was x15 (core freq. 3990.05 MHz) with the lowest possible stable voltage 1.4125. 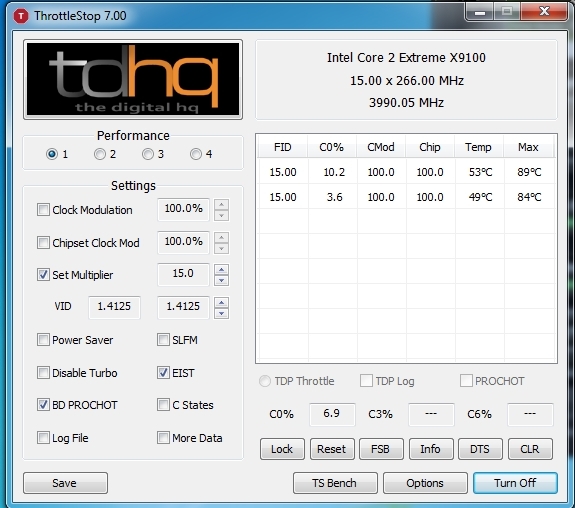 With this config the highest temperature reached up to 79 and the max CPU load was 100%. x16 multiplier with 1.5V made the game crash at the very start, seems to be not enough power. When I set the voltage at 1.5 for the multiplier x15, I was experiencing a huge performance decrease for some time during playing. It was happening quite often. I decreased voltage and it got better. I did that again and the performance drops have gone. I don't know why it happened. Maybe due to the high power consumption. One more thing I've found out is that RAM cannot be set at the latencies of 800MHz. It always works at the timings of 667MHz except for the CAS parameter which is 6T for 800MHz. I'm not an expert at RAM timings, so I don't know how bad it can be to use timings that do not correspond to their frequency. So at this point there's no need to flash RAM. The game was going fine at 5-5-5-15. But again, I'm not 100% sure if leaving the timings as they are will not cause troubles. My conclusion is based on my own basic testing only. 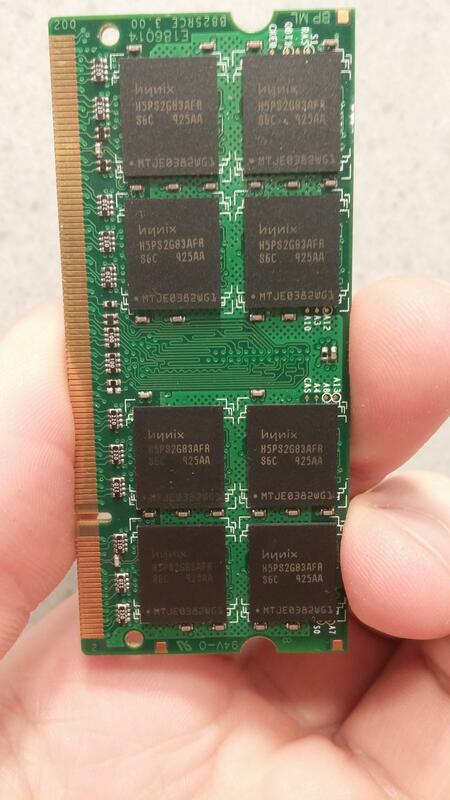 This is one of the faulty RAM. I noticed a strange thing. Can you see that the inscriptions on the 2 chips on the bottom part look darker than the others? When a chip gets affected by a high temperature, it goes like that. Usually it happens when a chip is replaced manually by a human. I can now see that this RAM was repaired before. Moreover, the module gets quite hot compared to the one I got recently. But the Chinese seller on Ebay sold me this faulty RAM as new. Be careful when buying from China.